Dedicate your prayers for the good fortune of your dear ones and deck it in the presence of this Lovely Rakhi Sweet and Spicy Hamper complemented with a free Fancy Rakhi, Roli, Tilak and Chawal on Raksha Bandhan. This Hamper comes with 100 gms. Assorted Dry Fruits, 200 gms. Haldiram Soan Papdi, 200 gms. 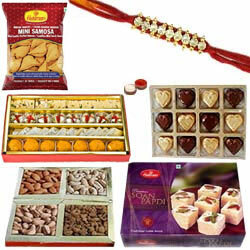 Haldiram Assorted Sweets, 200 gms. Haldiram Mini Samosa, 12 Pcs. Homemade Assorted Chocolates and 1 Fancy Rakhi. There might be a slight change in the displayed design of the Rakhi.